June | 2007 | Thy Glory O' Nigeria..! Yar Adua’s Assets Declaration is Meaningless! To me personally, This declaration of assets is meaningless. First, this government lacks legitimacy. Accepting the mandate of a crazy selection is the HEIGHT of dishonesty. Second, David Mark, a well known thief is his Senate President. What are we talking about? Before we can wipe corruption, we need a legitimate government that would have power at its disposal to bring all the thieves in Nigeria to book. 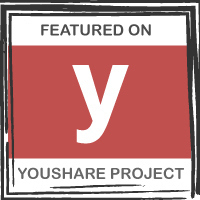 From Babangida, to Buhari, Shonekan, Obasanjo…and many others (from 1960 to 2007). Being mindless of the past in the present will not help us to shape the future. We must rights all wrongs. A legitimate govt is needed to probe all the past governors, Ministers and the people that we know stole our money and put 75% of Nigerians below the poverty line. Let them bring back all our monies. We want to use them for posterity. If we don’t bring justice to Nigeria, all these declarations are senseless. There must be a point in the history of our country called Turning Point. If we don’t get there…the masses will continue to suffer. This man Yar Adua will never have the courage to bring the change we seek. Someone will always remind him how he got to power, through the WORST ELECTION in the history of man! This is already playing out in the so called Government of National Unity. He is asking the other parties to drop their petitions so that they can join his govt and loot as they usually do. Let’s call a thief, a thief! Is Lagos the most dangerous city in the world? Lagos is the former capital of Nigeria. Many uninformed foreigners still considered Lagos to be the capital of Nigeria. To this category of people, Abuja is relatively unknown. I have encountered many people and young students in Europe who expressed surprise that Lagos was no longer the capital of Nigeria. It came to my mind recently to send an open letter to the governor of Lagos State and the Oba of Lagos. Among the rest of us, I am very convinced that these two important men are true Lagosians. In the letter which I’d not written, I would have asked them more than 21 questions. The most significant question would have been: Is this the Lagos of your dreams? An adept mind can quickly add, is this the Nigeria of our dreams? In the letter, I would have pointed out to them many of the things that are wrong with Lagos and give them a few tips of how to work out the solutions. Have our politicians and leaders started listening to great ideas yet? In the content of the letter, I would have told them that the reason why Europeans preferred East African countries or even Gambia for their holidays is because they read and also think that Lagos is among the most dangerous cities in the world. This much is written in many Travel Guides to Africa that I have read myself. Sometimes in the bookshops, I read so much about Nigeria that I feared the shopkeepers could ask me to pay for the reading or buy a copy of those travel books. Who comes to Lagos or not may not be important to the Oba or to the governor. But I am sure that the economic fortune of Gambia is enhanced by the number of visitors she receives annually from abroad. With important towns like Badagry, Ikorodu, Epe and Lagos Island itself, I can imagine what Lagos state stands to gain supposing it chooses to be a tourist attraction center. There are several tourist hotspots wasting away in Lagos. The problem of security of lives is important to visitors from outside. Apart from foreign workers who have no choice but to adapt to our system, it is difficult to imagine why other foreigners may come to Lagos. I found the answer to that puzzle recently. One more reason why some foreigners actually come to Lagos is to verify what they have read or heard about Lagos. They are curious and are in search of the real situation-the truth. 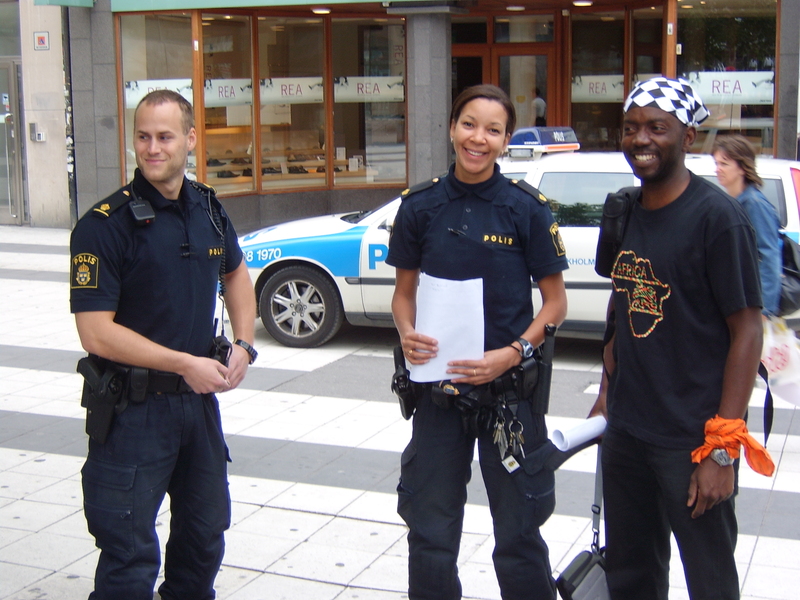 I actually felt Lagos in the air when the sounds of Lagos came on recently on a radio programme here in Stockholm. Instantly, I visualized market and traffic scenes at Oshodi, Mushin, Yaba, Palmgroove, Onipanu, CMS, Bariga, Okokomaiko, Mile 2, Iyana Iba and Ojuelegba among other busy places in Lagos. Some reporters from Sweden came to Lagos to see things for themselves and to interview a number of people. I think this is called investigative journalism. One man who was interviewed thanked God for saving his life in the several okada accidents that he had been involved in the last 5 years. He talked about many who have died and others who are still lying in the hospitals as a result of okada and other types of road accidents. Is anyone taking records of the souls that are lost daily in Lagos due to reckless driving with rickety molues, danfo buses, kabukabus and okadas as our undignified means of transportation? In the radio report which as mentioned earlier is a corroboration of what I have read in travel books about Africa, Lagos was confirmed as the most dangerous city in the world. Visiting Lagos was part of the experiments that the reporters had to do. They must have been to other places before in their life time. Now, I may not be in a position to give a non-bias response to this assertion. I lived in Lagos all of my life time in Nigeria. I refused to study outside Lagos and I almost succeeded in serving in Lagos but I landed in nearby Ibadan for my youth service in 1995/96. Trying not to be bias, in my own view, Lagos is indeed a dangerous city but I don’t know if it is the most dangerous in the world. People who have travelled round the world to seek the truth, like these reporters from Sweden, may probably have a fair opinion. Afterall, what will reporters from Sweden benefit if they described Lagos as the most dangerous city even though we don’t have gun shops like New York? We have cult activities but they are yet to be described as massacres. Indeed we don’t have gun shops, but has anyone read the descriptions of the guns and weapons that are used daily by armed robbers across Lagos? Some of the guns can be used under water! To what end will a common armed robber acquire such a sophisticated weapon? Are there treasuries or gold to be carted away from under the Lagos lagoon or bar beach? In a recent article published in the Guardian Luke Onyekakeyah had written that “Lagos is the most disorderly city in the world” (LASG: Ban one way traffic in Lagos, The Guardian June 19 2007). That statement may be correct because in that article Luke who has visited more than 30 cities worldwide wrote extensively on the comparisons between Lagos and other cities in Africa and elsewhere. I have not visited 30 cities yet but I have never in my life seen where people run to catch a danfo kind of bus and run to get off it. Once, a Ghanaian friend told me he landed in Lagos and was terrified to find out that there was a war going on in Nigeria. He was wrong, there was no war for real but he didn’t wait too long before he returned to his home country. 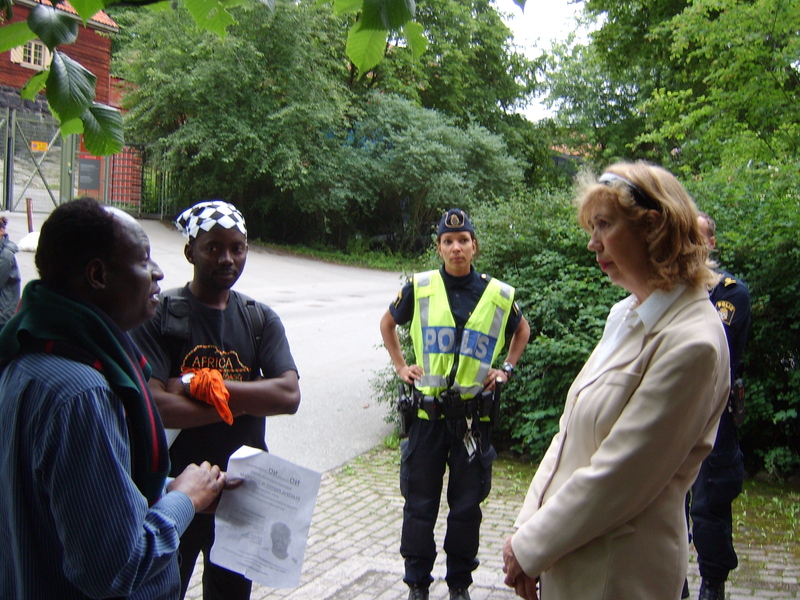 Apparently, those were the days that Ghanaians have to visit some Nordic embassies in Lagos to get visas. This guy should not come to Lagos again; he could die of shock this time. Things have gone from bad to worse since that time. In how many ways do we want to qualify dangerous before we can determine if truly Lagos is the most dangerous city in the world or not. Indeed, apart from deadly armed robberies which is present all over the country, Lagos transport is an accident on its own. My dear Swedish reporters were dazed that Lagos has more than 11 million people when the entire Sweden, as big as it is, has only about 9 million people. The population of Lagos has outstripped the available dilapidating facilities even at the time that Lagos was still the capital of Nigeria. Urban town planners were definitely out of the picture as most parts of Lagos degenerated into absolute jungles. In the name and spirit of patriotism, some of us will try to defend Lagos but we must not forget that we need to tell the truth so that policy makers can begin to see the need to do things the right way and take steps that will improve not just our international image, but the quality of the type of lives that we lead. Lagos is a nice place to live. I love Lagos and it is a city that I am proud of. But it would not be asking too much if we can make it a more organised and safer place.When I finally write my letter, it will be nice to see what the new governor of Lagos and the Oba can do about the embarrassing status of their common domain, our dearest Lagos. Don’t be alarmed, this is my personal thought. It is not a declaration from some group or organisation. Racism and maltreatment of people with African origin will NEVER stop. Today is historic in the life of Nigerians. Some concerned citizens have organized a worldwide demonstration to protest the MURDER of Osamuyia Aikpitanhi in the hands of the Spanish Police. He was killed on the 9th of June 2007 while been flown on a notorious IBERIA flight to Lagos. 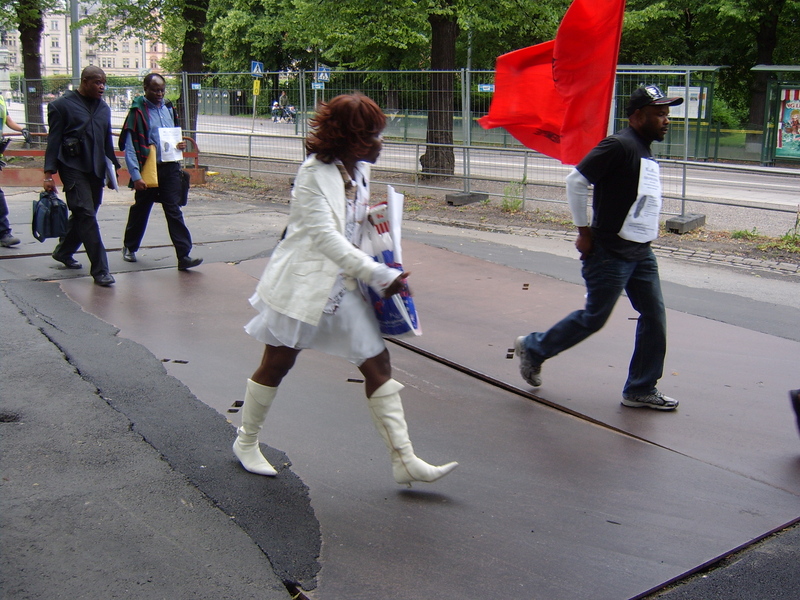 In Sweden, I took up the voluntary challenge to lead the protest. I have my friends and we do hang out a lot. Usually, they respond to my message when it’s time for party, meeting up in town or going for a game of football. 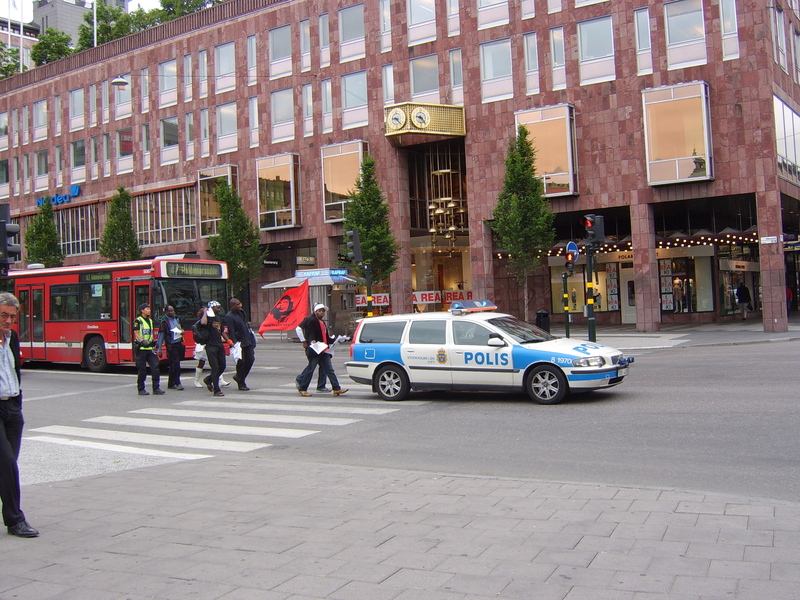 Today, only 7 people showed up for the demonstration that took place in Stockholm city. Five Nigerians, 1 Zimbabwean, and a Kenya lady was all the response that I got. I sent out more than 210 messages to over 70 people. I imagine that several more Nigerians got the message, some at very short notices. 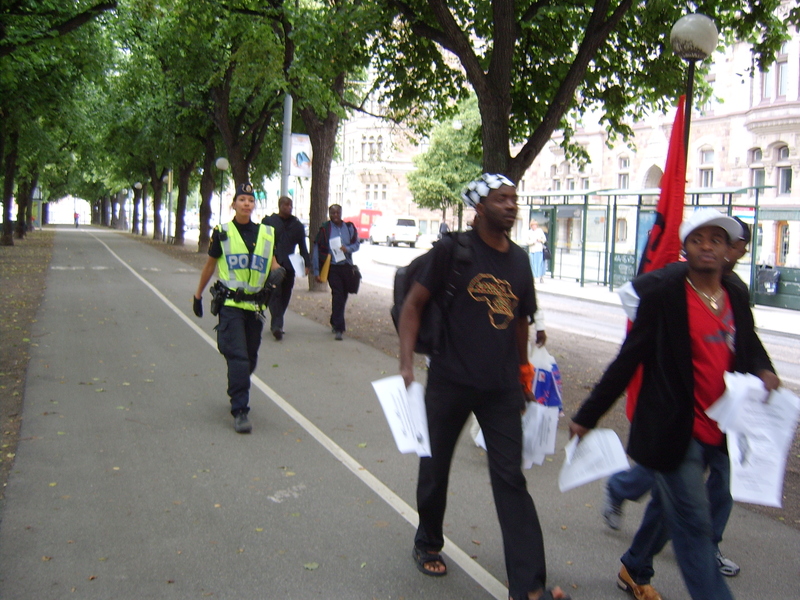 I posted messages on this site (and elsewhere) and I walked the length and breadth of Stockholm city for many days creating awareness and sensitizing people. The police on the other hand had 2 helicopters flying in the air. 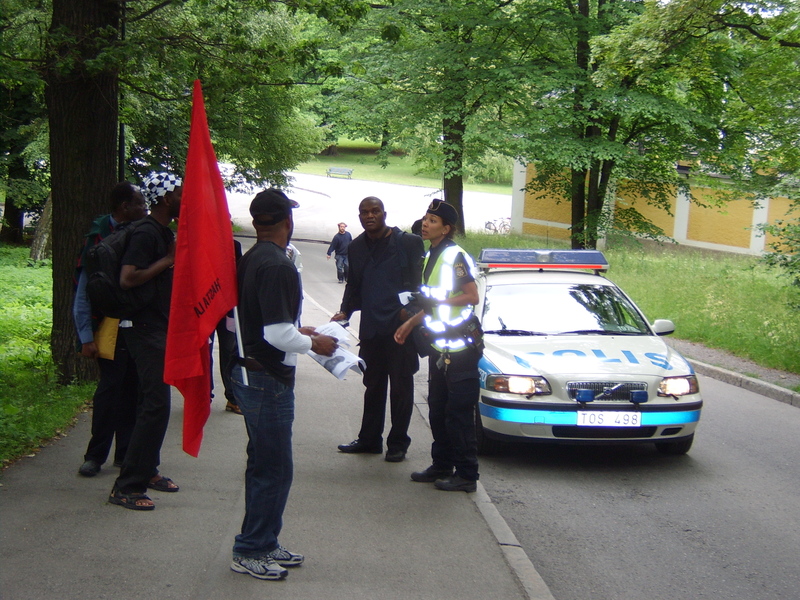 They gave us a car to lead us as we march on the streets of Stockholm. They had many other cars and patrols on standby. We marched like this: Sergelarkaden-Hamngatan-Norrmalmstorg-Nybroplan-Strandvägsallen-Djurgårdsbron-Djurgårdsvägen to Hazeliusbacken (just beside SKANSEN) where the Spanish embassy is located. ONLY 7 PEOPLE despite the hundreds of Africans that I reached out to and the endless messages to my Nigerian brothers!!! Now, you sit there in your house complaining about racism. Racism will NEVER stop. Today we got a chance to give our voices against racism, we BLEW the chance. The Police were at their best today waiting for us to gather. Folks were nowhere to be found. They have gone to work and they cannot ask for a day off to honour Osamuyia or to express their grievances over the maltreatment of Africans. A Kenyan lady was killed and dropped in water several months ago. Nobody did anything in public to express our collective shock. It was today that our East African brother and sister got some real inspiration that they too can protest the death of their sister. There is an African mentality that has confined our minds to enslavement. 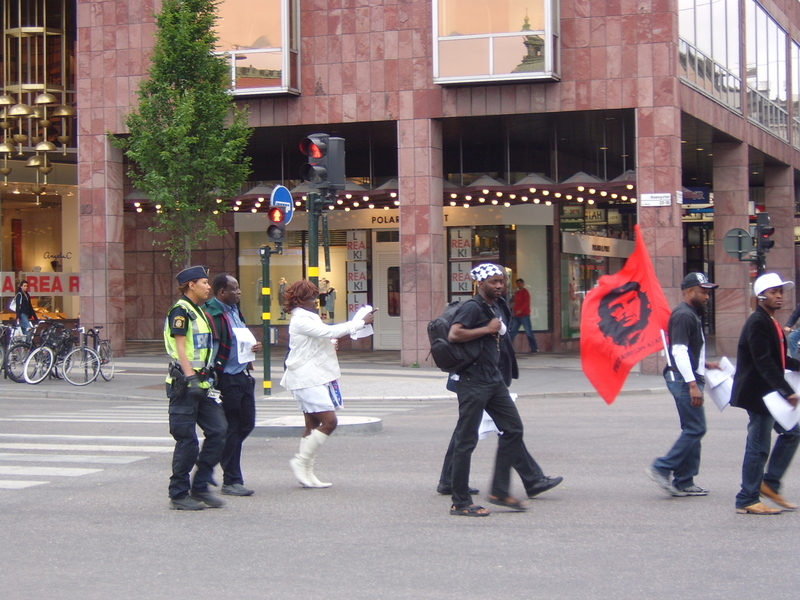 To have a gathering from Sergels Torg in the centre of Stockholm is almost an allergy to Africans. We are used to seeing only people from the Middle East and South America protest there every other day. Today presented a wonderful opportunity but there was no African brother or sister to maximize the begging opportunity. ONLY 7 of us! Africans lack the quality leadership that will make them free. Even when the leadership comes begging or presents itself on a platter of Gold, Africans look the other way or they just sit on the Fence. I don’t see the end of Racism as the start of the war against racism is in coma. I can write forever but I’ll leave the thinking to you, afterall the greatest judge is our conscience. May the Glory of Africa come, soon! From Kelvin Ebiri, Port Harcourt (Guardian on Thursday 28th). KIDNAPPERS of the toddler, Master St. Michael Steward, have demanded an undisclosed amount as ransom for the release of the child. Michael, the son of a Rivers State legislator, Mrs. Linda Steward, was abducted from a private school, Tantua International School, Port Harcourt, on Tuesday. The whereabouts of St. Michael remains unknown. A source close to the legislature, who pleaded anonymity, disclosed to The Guardian that the kidnappers had called the parents of the child to demand for an unspecified amount of money. Three armed young men said to be in their early 20’s, had on Tuesday morning gone to Tantua International School, Elekahia Housing Estate, Port Harcourt, and kidnapped the three-year-old boy. The source said the parents of the child are apprehensive over his safety and would want him released to them without further delay. According to him, the kidnappers alleged that the child was safe but declined to declare his whereabouts. When contacted yesterday, the State Commissioner of Police, Mr. Felix Ogbaudu, said he was not aware of any group demanding for ransom from the parents of the child. He said Police investigation into the matter was still on. Eyewitnesses told The Guardian on Tuesday that the three gunmen, after kidnapping the toddler, drove away in a Mazda saloon car towards Iwofe, one of the most notorious routes of kidnappers who often take their victims to the creeks to evade security agents. Attempts to reach the lawmaker on phone yesterday proved abortive because her mobile phone was switched off since Tuesday. Meanwhile, the Police in the state have continued a stop-and-search of all vehicles in Port Harcourt and its environs. St. Michael is the second child to be kidnapped from a private school in Port Harcourt. The first child has since been released to the parents. (This news is from the Guardian, June 28 2007). A MASSIVE protest by Nigerians is to be staged tomorrow across the globe to demand a probe into the maltreatment and subsequent killing of a Nigerian, Osamuyia Aikpitanhi, by Spanish law enforcement agencies on June 9, this year. 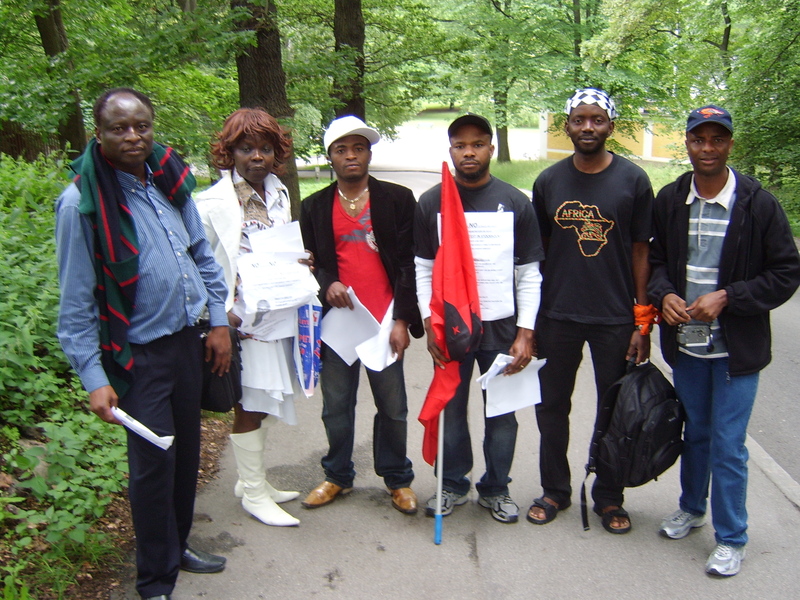 The march, being organised by a group called Concerned Nigerians Worldwide (CNW), is billed to hold in over 20 countries. According to reports, Aikpitanhi, a Nigerian immigrant, was arrested by Spanish agents and “loaded” into an Iberia aircraft bound for Lagos, Nigeria. 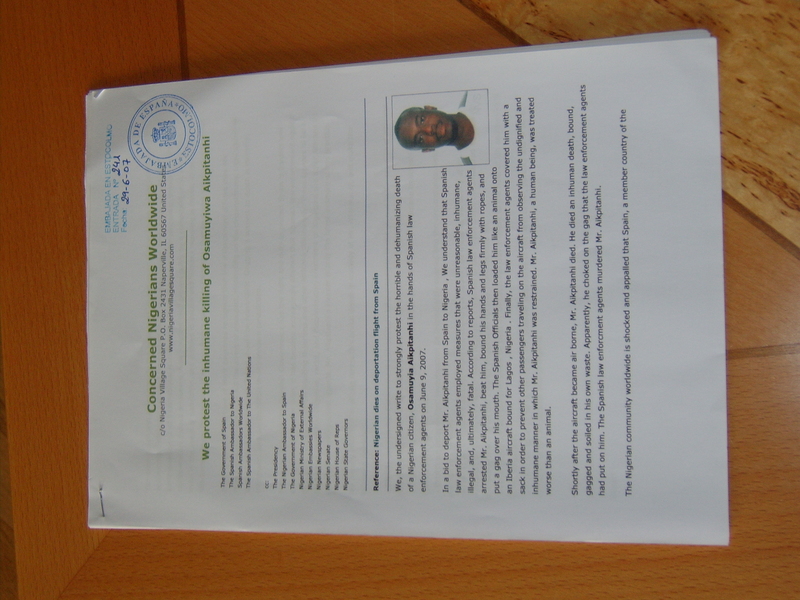 “This is murder,” claims Mr. Uche Nworah, spokesperson for the United Kingdom chapter of the CNW. The protests will take place at Spanish Embassies worldwide, including those in the United Kingdom (UK), United States of America (USA), France, Germany, Spain, Brazil and Nigeria. Country chapters of CNW are setting their local times, but full information is available at Hyperlink. 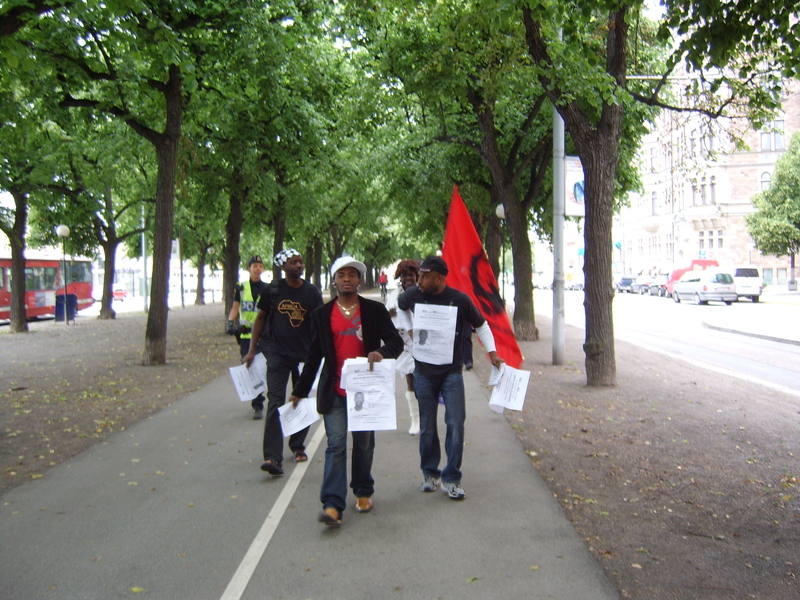 Adeola says: I am leading the Protest in Sweden. What is Fire Brigade Approach? What happened to a cup of rice at 30 kobo? May the Glory of Nigeria come, soon.